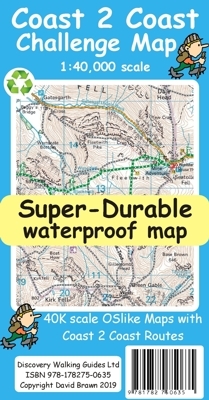 OSlike Super-Durable Map designed for walkers and hikers. The whole Coast 2 Coast on one double sided, 960mm by 694mm, map sheet. All 193 miles (308 kilometres) of the Wainwright route along with its alternatives are highlighted across 9 map sections at 40k scale. Ordnance Survey accuracy is combined with Tour & Trail map design to produce 40k scale map sections which are easy to read. OS 50k Landranger mapping is expanded to 40k scale making the text and features over 40% larger making them easy to read and understand. Wainwright’s C2C walking routes, and their alternatives, are specially highlighted in Tour & Trail style making the routes easy to find on the map and on the ground. Public ‘Rights of Way’ paths and bridleways are also highlighted in Tour & Trail style making them easy to recognise and find. Coast 2 Coast Challenge Map design is then printed on Polyart using 100% oxygenation inks to produce a lightweight, Super-Durable, waterproof map that is tough enough to shrug off the worst that the C2C can subject it to and still fold up like new at the end of each day. In addition to the Super-Durable printed map, Discovery Walking Guides offers you a free ‘C2C Digital Resources Package’. Simply follow the instructions on the map to receive a download link to the zip file, which contains all 9 map sections as digital Custom Map editions in kmz file format along with 13 gpx and 13 txt waypoint files covering the 13 stages of the C2C. Combining the Super-Durable Map with the Digital Resources Package gives you trouble free navigation for the whole C2C Challenge route from St Bees to Robin Hood’s Bay. All materials used in producing Super-Durable Maps are 100% recyclable in category 2 HDPE.